The legendary annihilation in 1883 of the volcano-island of Krakatoa (the name has since become a by-word for a cataclysmic disaster) was followed by an immense tsunami that killed nearly 40,000 people. Beyond the purely physical horrors of an event which has only very recently become properly understood, the eruption changed the world in more ways than could possibly be imagined. Dust swirled round the world for years, causing temperatures to plummet and sunsets to turn vivid with lurid and unsettling displays of light. The effects of the immense waves were felt as far away as France. Barometers in Bogota and Washington went haywire. Bodies were washed up in Zanzibar. The sound of the island's destruction was heard in Australia and India and on islands thousands of miles away. Most significantly of all, in view of today's new political climate, the eruption helped to trigger in Java a wave of murderous anti-western militancy by fundamentalist Muslims, one of the first eruptions of Islamic killings anywhere. 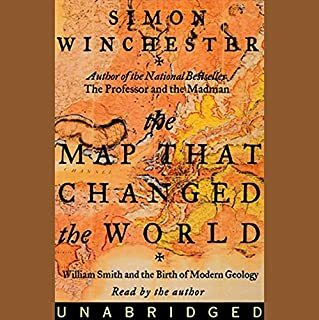 Simon Winchester's long experience in world wandering, history, and geology give this fascinating and iconic event an entirely new life and perspective. 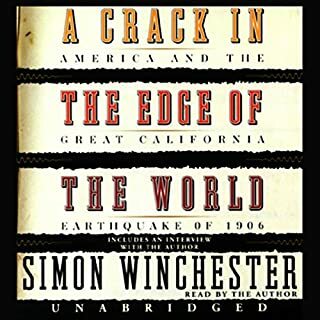 ©2003 Simon Winchester (P)2003 HarperCollinsPublishers, Inc.
About a month ago I requested this title from audible and was very excited to find it available now. The author is a geologist and writes in a very pleasant style, easy to follow and very unique. Interesting facts about the catastrophe itself but also about the world, the technology and the people of 1883 are connected and very well projected. I admire the author for his reading skills. Often I find that authors should not read their own books and leave that task to the professional actors, in this case though, I enjoyed it very much. He has an excellent voice, and since he describes a few personal encounters, it is very delightful that he reads those to the listener himself. If people don't like this book, they may expect something else than this first class science report. It is not a love story, nor an imaginary tale. If you read scientific american, enjoy good writing and a new voice to read to you, you will enjoy this book. 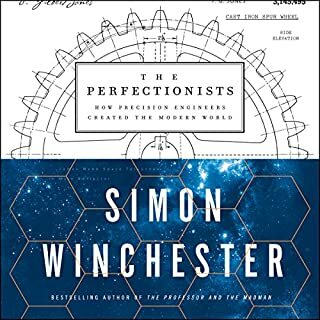 Once again I sing the praises of Simon Winchester. Here is a man who can tell a story! Now wait a minute -- this is NOT fiction. If you are looking for a novel, go elsewhere. This is the true, well-researched account of the most monumental disaster in recorded human history! It's the real thing! 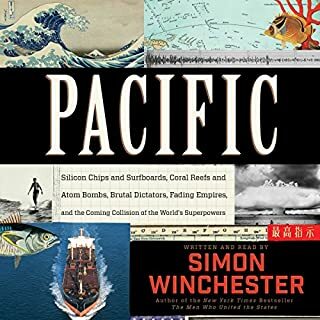 You can look in any encyclopedia and read about the eruption of Krakatau/Krakatoa, but Winchester gives you so much more! His research is astonishing and the way he explains it all in so much detail is wonderful! I like the way he put this horrible event in perspective regarding world events of the time and how the Krakatoa calamity may have caused some of the tension in the world we are living in today. I am not aware that the man is a geologist, but I know for certain he is a darn good writer. I love his reading style -- so properly British and all that... I am impressed by his ability to amass a lot of facts and work them into a fascinating narrative. History lesson? Why not! Keep them coming, Simon. I will read whatever you write and love every minute of it. I agree with one reviewer who said that your opinion of this book may depend on what you’re looking for. If you want a rip-snorting disaster epic, this won’t work. If you delight in grand historic events placed in context with history, politics, geography and science, told with a generous dollop of wry humor, you’re in the right place. The research is impressive, made accessible by the comfortably expert delivery. Who would have thought that plate tectonics could be not merely interesting, but entertaining? Winchester’s talent with words, his obvious affection for his subject, and his spot-on reading made this truth better than fiction. My only caveat, and the reason for only 4 stars overall, is that those who listen while driving don’t have the option of looking at maps while listening in order to keep the specific geographic points straight as they are described. But the story deserves full marks for successfully making history and science a riveting “read”. I learned much more than I expected, not just about the eruption, but about the global context of the event and its aftermath, including the cliffhanger that it is likely to happen again. A superb work, superbly read by the author. This is not an historical novel, so don't come to it looking for exciting fiction. Another reviewer had it right in saying that if you enjoy Scientific American, then you'll enjoy this. A perfect tapestry, woven from the threads of every field of science. Kudos. I've listened to this book several times. Winchester's voice is hynotic. He describes the history of Indonesia, pepper, Dutch colonialsim, tsunamis, early telegraph communication, the London Times, and the discovery of plate techtonics. It is a really wonderful book - well-researched and topical. The first 3 or 4 hours were very difficult to wade through. After that the narrative picked up and was quite enjoyable. Loaded with facts and somewhat tedious to listen too. If you love books full of details and in-depth history, as well as anecdotal tales and evidence, this book is for you! If you've read the Publisher's Summary and are expecting a book that's, well, "lively", you should probably look elsewhere. Case-in-point: It took nearly five hours to get to the explosion of Krakatoa! I'd seen this book in the book store and was beside myself with excitement when I saw it on Audible.com. Having just finished "Dirk Gently's Holistic Detective Agency" by Douglas Adams, I was looking for something a bit more serious and dramatic. Unfortunately, "Krakatoa" wasn't what I was expecting, explaining everything from the political and economical history of the area to plate tectonics and Darwinism. Obviously, the author is very knowledgable on the subject, and a tremendous amount of research must have gone into this book -- and on the subject of Krakatoa, I personally found the latter half of the book, following the explosion, much more interesting...especially the discussion about Islam. I just depends what you're looking for. 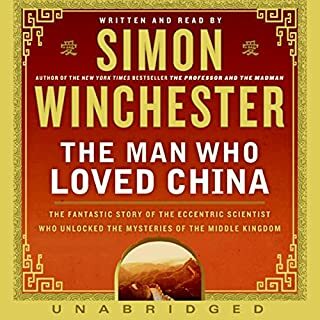 I found this book very interesting and enjoyable, and Simon Winchester does an excellent job of narrating his own book. Definitely worth the credit, and I'm now going to see what else Audible has available that's authored by him. The eruption of Krakatoa near Java and Sumatra in 1883 was the first major, natural disaster to occur in the early years of electric telegraphy and its undersea cables. By then all major cities and many smaller ones were connected by telegraph. News events could be sent around the world in an hour or two. The concept of the “global village” began in 1883 as the world quickly learned that all humankind survives at the caprice of Nature. 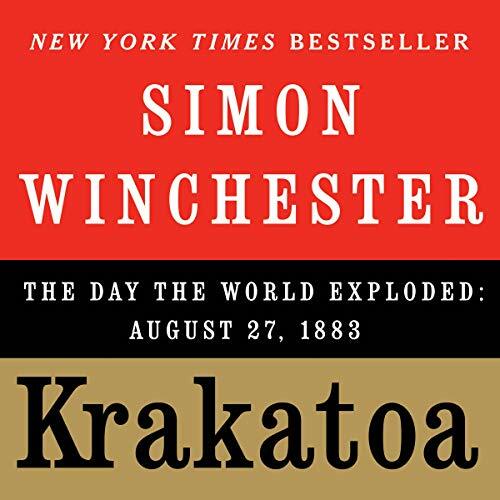 Simon Winchester’s book, “Krakatoa”, describes colonial history, early telegraphy and workings of geology leading up to the eruption. He then vividly depicts the series of warning eruptions over several months and finally the humongous explosions creating tsunamis killing over 36,000 people. The author describes the aftermath, including worldwide, barometric waves and colorful sunsets. Finally, there’s the robust return of life to initially sterile Anak Krakatoa (Child of Krakatoa). 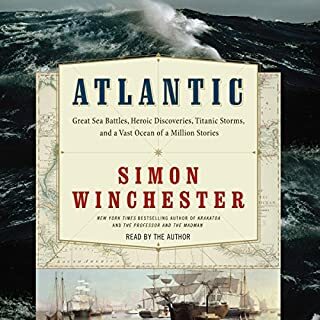 The author’s descriptions of the Dutch colonization of Indonesia, the role of gutta-percha in underwater cables, Alfred Wegener, plate tectonics and subduction, just to name a few, give the story greater depth. However, these may be tangential wanderings for some listeners. The author is his own reader. His conversational style and dry wit may not be sufficiently dynamic for some. One should listen to the audio sample and read some other reviews before buying the book. The reader is excellent and the background information the author gives you is incredible. This author gives you details from the basics of geology and why the volcano is there in the first place to the general placement of animals and plants in the archipeligo to first hand accounts of the mountain's demise and the after effects on the population. The accounts are vivid and personal. I would highly recommend this book to anyone with an interest in science and how it affects the larger world.